Over the years there’s been two opposing trends emerging in the planted tank community. These relate to how to one should keep their planted aquariums. And while there’s no right or wrong way, there’s a healthy rivalry between both sides, with both advocating for their preferred method. No doubt if you have been keeping planted tanks for a while you have heard the terms high-tech or low-tech planted tank being thrown around. These terms represent more than just the difference between them, to me they represent two different philosophies, two different ways of living the hobby. So first we should start by describing in detail both methods, and the differences between them. CO2 (Preferably pressurized) and dosing of high amounts of nutrients. The pros of such a tank is that being a high energy tank the hobbyist will not be limited in the choice of plants he can keep. Different plants have different needs, as they all come from different places and with time adapted to the conditions of their environment. Some plants need lots of light as in nature they grow close to the surface, others need less as they either grow deep under water or in shaded areas. So, in a high-tech planted tank one will be able to grow for example Hemianthus Cuba, which not being as hard to grow as some may believe, It does tend to die off if it does not have enough light, co2 and nutrients. I am going to quote here “having a high-tech tank is like having a set of crayons, in which you can use all the colours of the set, while having a low-tech tank only allows you to use a limited number of colours from said set” this was said by James Findley from the green machine and I believe it explains really well the difference in what you can grow in each tank. 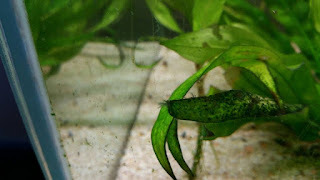 There are cons though, in a high-tech tank everything happens faster, meaning you’ll have to be on top of your maintenance, more trimmings, more water changes and harder to keep the balance which often leads to algae and failure. Many venture into the high-energy tanks only to quit in frustration. 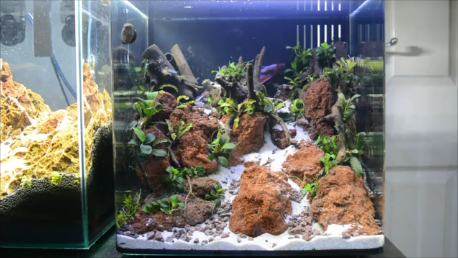 A high-tech tank will be more time consuming and expensive to keep overall, so one should always make sure he has time and can afford to keep such a tank before starting one. Some people are led to believe that true aquascapes need to be high-tech to be beautiful, this is not the case, however in a high-tech tank plants will grow more vibrant and bushy and obviously, the bigger amount of choice of plants can lead to more impressive results. But over the years I have seen amazing Low-techs. Low-tech however is not a new thing, I believe only the term is. 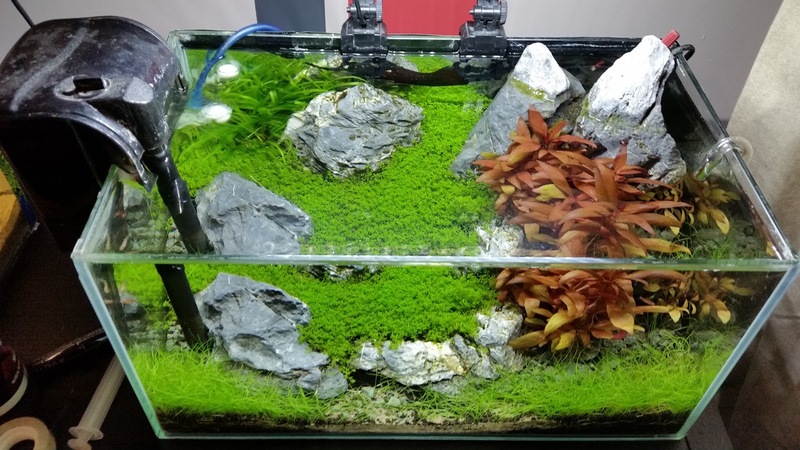 If you look back to the time before Takashi Amano introduced CO2 and the Nature aquarium trend into the hobby, you’ll most likely find that everyone was keeping their tanks in what we now call a low-tech environment. It was just not called like that then. So, what differentiates low-tech from high-tech is that they are opposites, while high-tech is a high-energy setup, the low-tech defines itself by using a lot less energy. Some will say that the only thing that differentiates these two is the use or not of co2. In many ways, they are right, but that’s not the whole picture. One cannot talk about co2, without light and nutrients as they are interconnected. No co2 means it need less light and nutrients. Like with the high-tech there are pros and cons. The pros are that because it is low-energy, everything happens much slower, so it will be less time consuming. 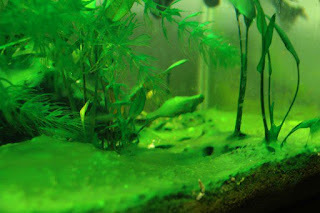 Less trimmings and less need for water changes hence algae will be much easier to control. This type of tank will also be a lot cheaper to assemble and run over time. The cons however are that growth will be slower, many hobbyists want their aquascapes to grow fast. It could be that they want to submit it to a contest and are on a deadline, or that it will be a display tank in a shop or event, some just like something that challenges them, there are many reasons for this and I just want to point out that for some a tank that requires less of their input is not really their cup of tea. Like I said before plant choice will be limited and growth will not be as vibrant and lush which some believe limits creativity. I entered this hobby at a time high-energy tanks were the next best thing; the Nature aquarium scene was rising fast and many people were using huge amounts of light and co2 in their tanks. This led to many people, myself included to dismiss low-tech tanks all together. But as knowledge of how to keep plants grew, aquascaping techniques evolved and new and more efficient equipment came in to the market people started realizing that we could keep plants without the need to have a power station above our aquariums. I believe beauty is in the eye of the viewer and that what’s beautiful to my eyes may not be to yours. Low-tech’s can be beautiful if one knows how to navigate its constraints and limitations, with the right choice of plants, patience, and a well-designed hardscape a low-tech aquarium can easily look as good if not better than many high-techs out there. I understand that it may not be everyone else’s cup of tea but for some people it’s the only way to experience the hobby and I believe things like time and money should not stop you from enjoying a nice aquascape in your living room. For the past few years’ hobbyists have been blending the lines between high-tech and low-tech, with increasingly hobbyists managing to grow harder plants on low energy and no co2 setups, or many high-tech tanks using less light and a better balance between co2 and nutrients to achieve results once only believed possible on very high light setups. 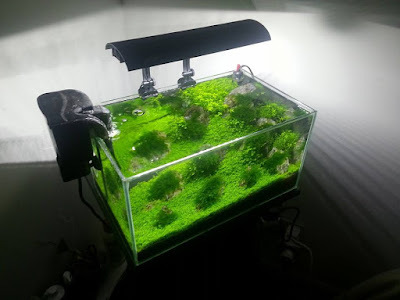 As time passes we are seeing a rise of what one could call the mid-tech planted aquarium, where good plant husbandry is more important than the tech that powers the aquarium. Whether you're growing a full crop of lettuce and herbs or taking care of a houseplant, you have several different types of technology when selecting a grow light bulb for your indoor plants.